I am still in a bit of disbelief about the words in the title. As would be expected because of his Asperger’s, my son has always hated writing. In fact, we’ve had to have various discussions with his teachers about his most negative behaviors manifesting as a result of writing: an assignment, having to brainstorm a topic, or even having to explain his thoughts about how to solve a problem in math (and he LOVES math) in writing. He would have a meltdown, shut down, or say he was not a good writer. Until this year. He has actually always been a good writer. His ideas are definitely inspired by video games. But he can track multiple characters over the course of eight or so pages. His story lines, while sometimes hard to follow, are still there. His dialogue is funny. But this year, he didn’t put up a “fight” for nearly as long as he had in previous years when he was assigned writing. Getting to use Google docs and sharing his writing with myself and peers has seemed to add to his interest in writing. 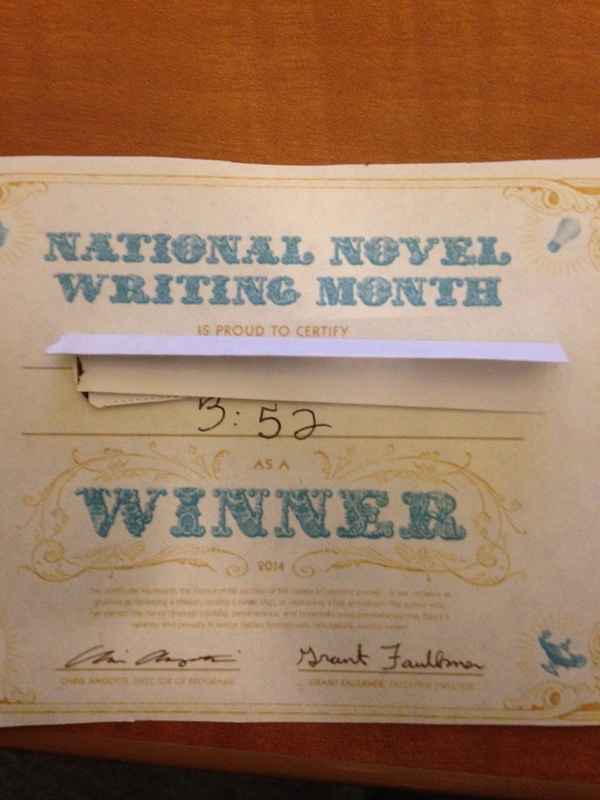 Actually, making it a bit of a competition (with himself and a goal, not with other students), such as through NaNoWriMo, encouraged him to write 5009 words (5000 is the goal he set for himself), in over 59 chapters (some are very short). He submitted his essay earlier today. Additionally, he is completing a passion project. This requires that he actually have his own blog and write about his own topic. You will laugh, but his passion is Pi. He is composing a multi-modal piece about what he loves: math. I attribute these writing successes and his seeing himself more as a writer to his teachers allowing him to have complete choice during writing. He has found his voice, as well, with the help of technology. As an aside, it gives those of us who know him a very interesting glimpse into his beautiful mind. This past week was a rough one for my eleven year old. I felt quite conflicted in how to respond. I wanted to comfort him, protect him, defend him. I wanted to tell him it was sort of his fault because of the goofy noise he made. But that would make him feel worse. So I just listened and then asked him to share what happened with his social skills teacher. “Someone at chorus said “Shut up!” to me. I raised my hand to tell someone, and he said “bet you $10 you’re going to tell on me.” Some girls standing close kept laughing while looking at me. Tried talking to Dad. About as understanding as the people that did it. I felt so badly for him. I felt helpless. How do I help? What do I say? What is the right advice? Sixth grade social interactions are much more complex than, tell an adult (still important advice). But they cannot be there for every moment or help him understand situations as they are happening. I’m going to start by continuing to be a mom who listens – who he can talk to about how he feels. I might see if he could ask them, how would you feel if you were me? But as there’s no formula for the right response, I think I will just make sure I know what’s going on, listen, and let him know that not everyone in his life will act this way. This is how I will start to give my help. I had the opportunity to be called in to assess two students who are thought to or have an autism spectrum diagnosis. This happens from time to time, due to the fact that we use a reading assessment that works to understanding more than just the literal level of comprehension. These students will often get “stuck” during testing after their accuracy can’t overcome missing comprehension questions. My questions are always two-fold: are the student’s executive functioning “disability” (organization) and weak central coherence (details, not main ideas) getting in the way of his/her expressing what he/she knows? Or is the way the test is written getting in the way of allowing the students to “show what they know.” Either way, I have to dig deeper to understand this student more clearly. I don’t break protocol, just for the sake of breaking it. In these instances however, when I ask, what is this character like, and a student replies, he’s a boy, I can see that I have to do a better job of sharing what I am looking to have answered. Sometimes, I am just explicit. I might say, These questions are going to ask you to inference. I brought an umbrella to school today. What’s the weather like? When the student says, “It’s raining,” I share that they just inferenced: put your background knowledge together with clues from the text. Other times, I simply offer a model for what I’m asking the student to do. I explain, The story has a lot of descriptive words. If I were to describe this room, I would say that it’s in the shape of a square, that it’s white, and that it’s very bright. What did the author do to describe (the character, the event, the animal) to you? In one instance, I offered a student a “when,… then” scenario and provided a countdown to how many more questions I was going to ask. It helped him clearly know when this experience with me was going to end. During a graduate reading class during which I was to learn to use DIBLES, I used my son (of course), to practice on. When I asked him to tell me about the story, he literally thought I wanted him to review every detail he had just read. Instead of doing that, he replied, I don’t know. When I revised my question to, share three things you learned about in the story, he gave me five – in order. If that wasn’t “meeting the criteria,” I’m not sure what was. The point is, sometimes in education, we don’t always “see” things as clearly from a specific point of view, such as that from the child with ASD. We worry about giving the answers away, when they don’t understand the question we are asking. I’m giving the teachers with whom I work to find out the root cause. Last week I attended the Keystone State Reading Association annual conference and had the privilege of hearing author, Jonathan Friesen, speak. He told about his tumultuous youth dealing with Tourettes and epilepsy. He asked the audience of teachers, when thinking about their students, to consider the questions that run through children’s minds: Do you see me? Do you like what you see? His personal story was riddled with bullying. I connected what he was describing to some of the social issues I worry that my son with Asperger’s faces. Friesen’s tribulations were quite severe. However, all children who are “different” face bullying at some level during their schooling. Often by peers; sadly, sometimes by teachers. R. J. Palacio’s Wonder is a perfect picture of what any child can face. My son is both prone and sensitive to bullying. Luckily for us, my son “has been seen” by more peers and teachers than not. In pre-school he was seen by his teacher as a reader and by his peers as someone would would read to them whenever they asked. In Kindergarten, he was seen by his teacher as being capable of going to school without an aide; his classmates saw him as a kind friend. In first grade, his teacher saw his giftedness for numeracy. His friends saw him as a helper. In second grade, his teacher continued to recognize his math skills and the students in first grade saw him as their tutor. I don’t always worry about if others like what they see, because I believe in not always seeking others’ approval. We won’t always receive it, regardless of how worthy we are of it, or how hard we work to earn it. But being seen is priceless. As a result of being seen so early, my son has succeeded in attending math class with students a year older than himself. There is no bullying, despite the gaps in social skills, because these students have been guided by a sensitive teacher to see his positives over his quirks. I have met students who, upon learning he is my son, comment, “I know him. He’s so smart.” It’s not being called smart that is the key. It’s that they know him and see him for how he has been gifted. I thank all of the people in my son’s life who have taken the time to see that he is worth being seen. Who can you “see” and let know you see them, in your life?